OK, cards on the table. 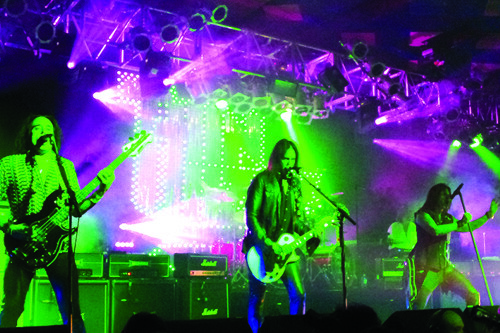 I attended the first date on Thin Lizzy’s 2012 tour mainly to see the fantastic Heavy Groovin’ Rockers Clutch, a band who in the four times I’d seen them before had never failed to deliver a precise power packed performance. This occasion was to prove to be no different and with the band given a generous 50 minutes to impress with their intricately riff fuelled, yet catchy as hell songs, they not only preached convincingly to the converted, but tonight also made some new friends. They may not appear to be the most obvious Rock Stars, what with singer Neil Fallon looking like your scary grizzly bearded uncle, while guitarist Tim Sult and bassist Dan Maines are studious to a fault. However between them they make a focused and irresistible racket and in the shape of drummer Jean-Paul Gaster they possess possibly the most under rated drummer in any genre of Rock music. This was another master-class from a band that surely deserve to be able to command a headline slot in this country in the future. My last, in fact only, dalliance with any incarnation of Thin Lizzy came a few years ago when guitarists Scott Gorham and John Sykes led a surprisingly Heavy Metal styled version of the band alongside bassist Marco Mendoza and drummer Tommy Aldridge. The latter of that rhythm pair is one of my all time favourite drummers, however Aldridge’s over playing and insistence on firing out double bass drum flurries infuriated and frustrated in equal measure, altering the band’s whole musical ethos. Whether Gorham also felt the same or not, a rethink was needed and thankfully a more authentic sounding version of Thin Lizzy appeared in 2010. 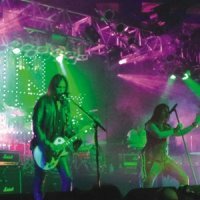 After another couple of personnel shuffles, the line-up is now completed by fellow Lizzy legends Brian Downey (drums) and Darren Wharton (keyboards), the returning Mendoza, riff-master Damon Johnson (Alice Cooper/Brother Cane) and one time Almighty frontman Ricky Warwick on vocals, who at times adds a third guitar to the brew. Bursting into life with a vicious ‘Are You Ready?’, it was immediately clear that Thin Lizzy circa 2012 is a band not only capable of blasting out hard hitting versions of the songs that made the band name famous in the first place, but one with the subtlety, ability and know how to do so in a way that stays true to Lizzy’s roots. The key to that is the return of “The King of Shuffle” as he was introduced on the night, Brian Downey, who not only brings a classy poise to the band, but also makes it a little more comfortable to call the line-up Thin Lizzy in the first place. A lot has been said about Ricky Warwick being the perfect singer to evoke the memory of Lizzy past and on the evidence of tonight’s show, that is a spot on assessment. In no way does he try to mimic Phil Lynott, (a wise move) but in every way he sounds absolutely perfect on this material, to the extent that a duet on ‘Still In Love With You’ with keyboard player Darren Wharton (a technically more gifted singer), finds the gravely Belfast tones courtesy of Warwick, to be more palatable in these surroundings. Introducing ‘Jailbreak’ as early as the second song is a masterstroke, but then again any set containing genre milestones such as ‘Bad Reputation’, ‘Suicide’, ‘Waiting For An Alibi’ or ‘The Cowboy Song’ is never going to exactly struggle for momentum. Gorham looks like the cat that got the cream, with his reserved stage manner being the perfect contrast to the bizarre crotch thrusting of the leather panted Mendoza (I reckon it’s still 1982 in Marco’s leg apparel...) and the more in your face posing and preening of Johnson. The latter of which proves to have been a real find for the band. More highlights come and go in the shape of ‘The Boys Are Back In Town’, ‘Emerald’ and ‘Whiskey In The Jar’, before the encores of ‘Rosalie’ and ‘Black Rose’ ensure that everyone in attendance goes home with a huge smile and a hoarse throat!